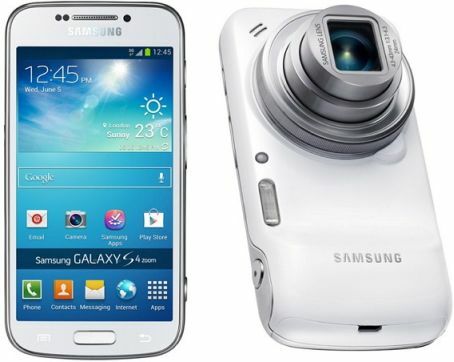 Samsung has launched its new flagship smartphone Galaxy S4 Zoom in the Galaxy series. The phone has 16 MP CMOS sensor camera and this is the first device supports both smartphone and 10x optical zoom feature. It comes with a 4.3 inch HD Super Amoled display with the resolution of 960x540 pixels and the display is protected by Gorilla Glass protection. Galaxy S4 Zoom runs on Android 4.2 Jelly Bean operating system and powered by 1.5 GHz dual core processor with 1.5 GB of RAM. The phone has 8 GB of internal memory and expandable up to 64 GB with microSD cards. The phone comes with a 16 MP rear camera with Xenon flash, BSI sensor and 10x optical zoom and there is also 1.9 MP front facing camera for video calls. The Galaxy S4 Zoom has some more utilities including Zoom Ring lets you zoom and offers new features such as sending photos via MMS while you are in calling. The photo suggest feature helps you to get the good nearby location of library photos and the Smart mode feature to get best mode based on surrounding factors. Samung Galaxy S4 Zoom comes in Black and White colors and it is officially priced at Rs. 29390. It comes with a free flip cover and 2 GB of free 3G data for Reliance customers. Now you can pre-order the mobile from Samsung official e-Store and the device would be available from end of this month July 2013.